Within the nature collection at Melbourne Museum, I discovered a plant called ‘Mookitch’, commonly referred to as the Large Kangaroo Apple. Upon further investigation I found that the fruit produced by this plant were highly valued for taste and medicinal benefits among Australia’s indigenous population. However, they could only be eaten when very ripe. If eaten outside of this period these fruits were highly toxic causing internal bleeding. At their ripest these fruits were a taste sensation, sickly-sweet with a bitter after-taste, but in their pre or post ripened state they were acrimoniously nauseating. This potentially life threatening pursuit of taste for the aborigines, got me thinking how important the sense of taste actually is. An aborigine would know by tasting the plant if it was ripe and safe to eat, if not, then an immediate spit out and rinse would ensure the content did not pass through the digestive system, thus saving them from severe contamination. Humans understanding nature through their senses, those with the better taste buds would survive or live longer. Something dawned on my consciousness, my taste buds will never be used as intended, for survival, or for harmonious transaction between man and nature. All the food I eat, I know is safe, ripe, tested, farmed and controlled. The food I eat belongs to a profit driven market of commodities and goods. I am tasting what I can afford, what is manufactured for me, and what the market wants me to eat, and, even if I grow apples in my garden, the tree plant I’m sure would have been purchased at a garden centre at a premium price. My experience of taste is not orchestrated by nature, but by a socio-economic system, a system that both enables and prevents me from tasting food. What we taste, living in the developed world, is in the most part influenced by; fertilisers, mechanical farming, delivery schedules, commodity prices, taxation rules, corporations and businesses; whom seem to, from experience of growing up in the UK, invest heavily in adding great qualities of sugar and salt to the food that we eat. To eat you need money, therefore to taste you need money. I have become addicted to taste, therefore indirectly, I have also become addicted to money. I crave the salts, the sugars, the carbohydrates. As I write this text I am feasting on a bag of ‘Pascals Pineapple Lumps’ made with 4% real fruit juice, sugar, water, a concoction of E numbers and modified flavours – which is far removed from the ripened berries of the ‘Mookitch’ bush. So assuming two things a) that our taste is now in many cases prompted by the amount of money we have, and b) that the foundations of money as a modern economic system used to relate to the amount of Gold you had in reserves. Then there is an argument to suggest that our taste buds, and exploration of them today, has been indirectly influenced by mankind’s pursuit of gold and money. Value has shifted from the harmonious taste of nature, to a taste for money. 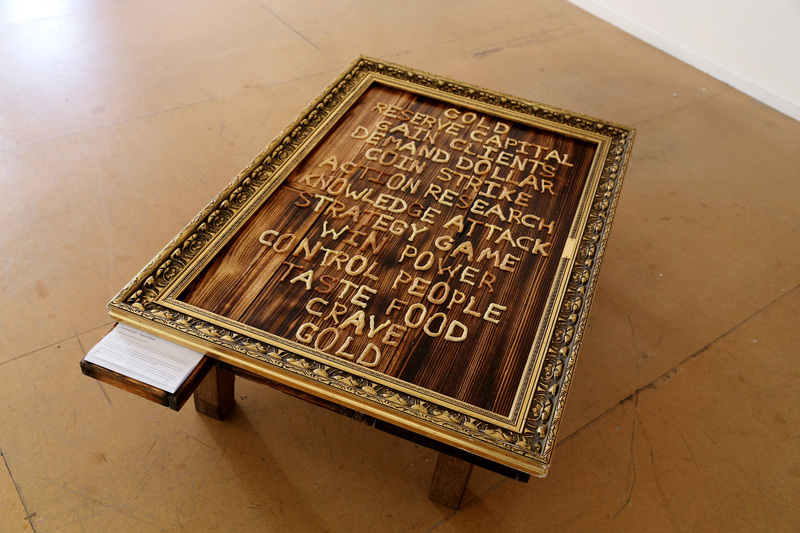 This text based artwork presents a graphical poem of word associations that relate to taste, capital, gold and greed. 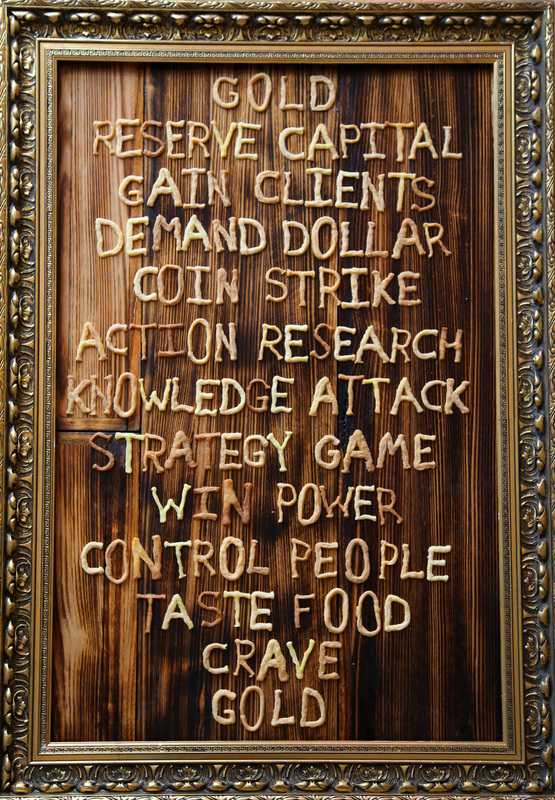 Each letter is an edible short crust biscuit which is both sweet and salty, which seem to be the two main taste buds being satisfied by the profit driven food market of today. 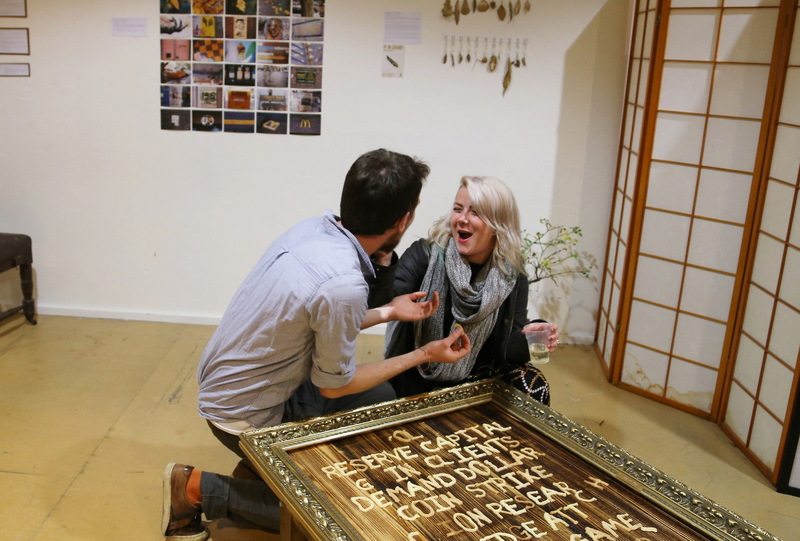 The audience are invited to come and eat a letter. They may not be tasting gold in a literal sense, but indirectly they are eating the same old capital that has been recycled, reused and reinvested for centuries, capital generated from Gold Rush discoveries centuries earlier. The ingredients being just another product of the capitalist marketplace. In some cases former edible indigenous fruits, which used to be so plentiful, are now quite rare and forgotten, and if you are lucky enough to taste them they will probably be as a side order in 5 star restaurants shadowed by the high rise buildings of Melbourne’s sky scrapers. I can see why some indigenous Australians are often disgruntled with western ways of living.